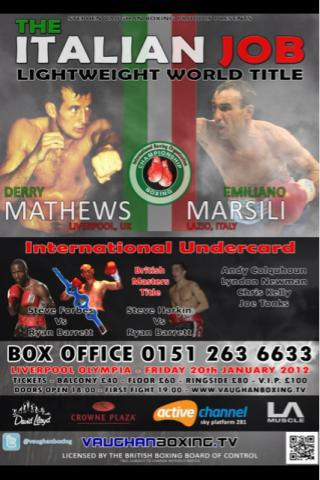 Stocky Italian southpaw Emiliano Marsili beat up and knocked down a game Derry Mathews at the Liverpool Olympia on Friday, January 20 to secure his tenth knockout victory as a professional, claiming the vacant IBO lightweight world championship title in the process. Marsili’s tactic was shock-and-awe as he overwhelmed Matthews with a brutal combination of speed and power, leaving the home fighter a bloody mess. Fighting for his first world title since losing the WBU featherweight belt to Choi Tseveenpurev in 2008, Matthews was tentative in round one while Marsili brought the action, set the pace and generally perplexed the Liverpudlian who appeared to have prepared for a slower, less frenetic and jittery boxer. In between rounds one and two there was an unforeseen delay in returning to the trade as, bizarrely, the lights went out. An awkward southpaw, Marsili – despite his opponent being nicknamed Dirty – brought out portside tactics by stepping on Matthews’ toes with his lead right foot. Matthews returned to the blue corner with claret trickling out of his hooter as Marsili had successfully roughed him up in the opening exchanges. Marsili, like he had done in the first two rounds, ended the third the cleverer, stronger, more active fighter and, before he took to his stool, rose his arms aloft whilst staring Matthews down. Matthews not only had to figure out the southpaw stance, but also his opponent’s constant bouncing. It seemed to put Matthews off and while he looked for an opening, Marsili would connect with a jab and dig a left cross into the home fighter’s solar plexus. Matthews attempted to take the fight to Marsili’s body but in return took a number of clean punches to the face and ended up leaking heavy blood from his nose. Noting Derry’s injury, Marsili pounded the nose in round five, looking to aggravate any potential fracture further in order to diminish Matthews’ ability to breathe, however, for the first time in the fight, Matthews matched Marsili’s macho aggression and it was not something the Italian prizefighter liked as he took three-punch combinations to the face and retreated. Throwing an abundance of punches in the sixth, Matthews caught Marsili with heavy leather, but, in the final minute, tormented the crowd favourite by exploding the swelling on his eye which consequently pissed blood, before powering a punch into his body which felled Matthews who began to look like a defeated fighter. Sporting a mask of blood, with cuts to his eye, leaking out his nose and mouth, Matthews was pulled out of the bout by the referee as Emiliano Marsili’s rock’em sock’em tactic reaped dividends in the seventh round. Both fighters then discussed a rematch in Italy but, for now, Matthews dropped down to 29-6-1, 15ko while Marsili jumped up to 24-0-1, 10ko.